They brought you Beer, Cheese, and Chocolate, but now they want Tacos!! The fourth installment of the Brooklyn Food Experiments is happening this very weekend, and to the winner goes the glory and a vacation! What, what! 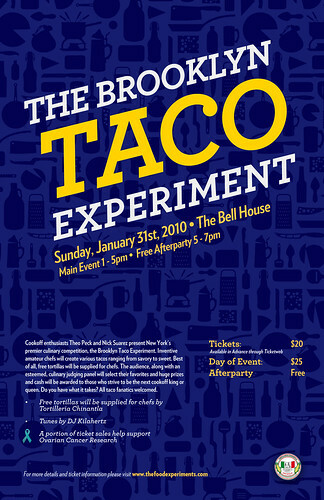 From what Nick Suarez has told us, there are over 25 different tacos showing up with enough variations to keep everyone happy, along with your complimentary beer with ticket. After you've eaten all the tacos, indulge in free churros and hot chocolate from Cascabel Taqueria, or a Maker's Mark open bar. Holy queso. But the winner of this shindig is going to M.E.X.I.C.O. care of Aero Mexico. You can't beat that. The runner-up isn't making out so bad either with $150 cash money, a private tour of the Red Hook taco vendors with Mr. Cesar Fuentes, and lunch for 4 at the stands. To all the contestants, you need to bring it, for reals. For more information, check out thefoodexperiments.com. Tickets are $20 in advance (meaning buy now), or $25 at the door (if there are any left). Click here to buy tickets. As always, a portion of the sales go to support Ovarian Cancer Research.